The rumors are true. 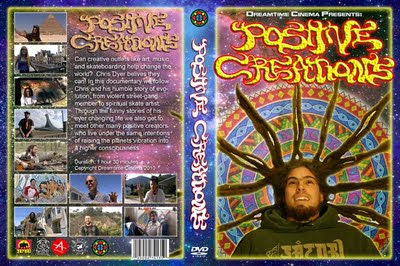 Positive Creations, The Movie, has been in the works for the past year. An initiative of Dreamtime Cinema, a small production company from Arkansas, I filmed everything to do with my art and positive soul expressions in general for the laps of a year. In that time I did interviews with many awesome people including other artists like Alex Grey, Other and Andy Howell; musicians like Jah Sun, Sixtoo and Midnite; and Pro skaters like Karl Watson, Ron Allen, Bob Burnquist, Nilton Neves, Barry Walsh, etc. The film is now being edited in the states by the Dreamtime team and will be shown at several film Festivals in 2010. It will then be a dvd available for your enjoyment.